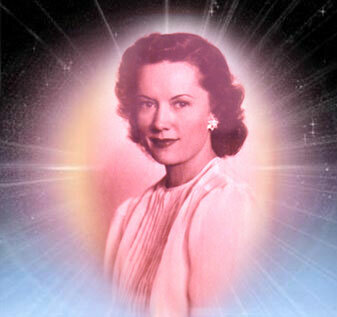 Ruth Hawkins made the transition from her physical body at the age of 88 from Albuquerque, New Mexico and attained Her Ascension in October 1995, ascending from the Temple of the Sun Retreat in the etheric plane over Manhattan, New York. She became One with her beloved I AM Presence, joining her beloved Twin Flame, Paul the Venetian - the Chohan of God's Third Ray of Love, in the Ascended Master Octave. "All things are possible unto those who love!" " . . . Now I think I have made myself clear, as I wonder if on this My first occasion of speaking to you, I have truly conveyed to you My deep desiring. My deep desiring, beloved, is to share with you the great Love of Twin Flames, especially of Ascended Twin Flames. Ascended Twin Flames Who occupy the same Fiery Ovoid may move through the universes in all dimensions and octaves, carrying, as it were, a Sphere. And the Spheres of the Causal Body as these Spheres have been developed over centuries: a great Sphere of Being that allows Twin Flames, and Ourselves specifically, to reach untold millions of souls that are in different dimensions of being, different systems. "The universes are far-flung, beloved. We are grateful to be stationed in New York City, at the Temple of the Sun, for there so many of different races and backrounds make their way through that city and then throughout the nation. "So each soul that comes representing a different evolution of a different time, a different root race, makes one individual or thousands of that same root race have special qualities, a special service to offer, and then again that is multiplied by the tremendous creativity that everyone has, though many have not touched, in the Secret Chamber of the Heart. "Those of you who are artists of one kind or another, understand that the greatest art of all is the art of loving and living in the Secret Chamber of the Heart with your Holy Christ Self. When you are able to do this, you know that you are moving closer and closer to your Ascension. "Let nothing stop you, beloved. For you are not a point of Eternity until you are Immortal. With all of my Heart's Love I tell you that no matter how great the challenge, no matter how great the pain, no matter what it takes to overcome the sinister force and to beat down the demons of the night, go for it, do it! You can have, not only your glorious Victory in this life, but your Eternal Union with your Twin Flame - who is either waiting for you in Heaven or helping you along on earth. "I AM your beloved Ruth. I shall be with you always, for I AM a part of your mandala. I seal you in all the Love of My Heart, and I tell you, to each one, all things are possible unto those who love!" "The Complement of My Lifestream will one day become the Goddess of Beauty." through the Messenger, Geraldine Innocente, 1953, U.S.A.
She was a fiery, stalwart soul who gave greatly to the cause of the Great White Brotherhood. She had blonde hair and beautiful crystal-clear blue eyes. Her manner was regal, and she carried herself with dignity. It was said of her that she never spoke unkindly about anyone, and that she never saw the negative in anyone. 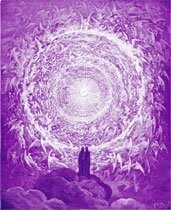 In 1971 in a service conducted by Mark Prophet, Ruth Hawkins was knighted by Saint Germain for her tireless and faithful work and her meritorious service to the Ascended Masters. He knighted her "Lady Adoremus". Ruth was also an artist who painted a number of the Masters' pictures. She dedicated her life to Paul the Venetian. At his request, she made a trip to France with another Ascended Master student in the fall of 1984. They rented an apartment in Paris where they invoked Violet Flame for the people of France and for the youth of the world for one half hour three times daily for four months in the morning, afternoon and evening. 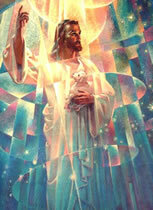 Ruth was living in Albuquerque, New Mexico, when she attained her Ascension in October 1995 at the age of eighty-eight. Call to Her and to Beloved Paul the Venetian to intensify Love in the Hearts of the people of the world, especially the youth of the world.